This may seem like a strange topic, especially if you aren’t sure whether or not you’re flat-footed. Unfortunately, statistics point to there being a strong chance that you fall into the flat-footed crowd, also called individuals who “overpronate.” Running Warehouse claims that between 50-60% of people overpronate and 20-30% do so severely. So forgive me for nerding out on you today…this science is important. Pronation (also called eversion) is a desirable movement of the foot as it strikes the ground. The foot’s arch “collapses” in a controlled manner towards the ground and helps the body absorb shock and send the force up through the muscles of the body. This is an integral part of anyone’s gait cycle in both walking and running. When someone overpronates their foot’s arch flattens excessively and their tibia (lower leg bone) is driven into unnecessary rotation that leads to torque on the knee, stress on the hips, poor utilization of the gluteal muscles and more (see diagram below). There’s a classic chain of muscular compensations that occur up through the body in response to overpronation. Unfortunately, this places excessive stress on the joints and causes some muscles to be overly tight and others to be inappropriately weak. Hence, overpronators are highly susceptible to running injuries, the formation of bunions, medial ankle sprains, shin splints, plantar fasciitis, MCL and meniscus tears, hamstring and hip flexor tightness, IT-band syndrome, lower back pain and more. Traditional remedies for overpronation include getting custom orthotics, wearing supportive athletic shoes and kinesio taping of the foot to control pronation. These are all great and generally effective but I notice that they don’t solve the issue entirely. A lot of regaining comfort and function in the body comes down to awareness of how to intentionally correct misalignments and gait patterns, and how to appropriately strengthen and release muscles that are negatively impacted by this pattern. I’ve taken people in their 60s and 70s and helped them correct overpronation simply by focusing on how they walk – and I’ve got to say, I feel confident that these corrections are going to keep them walking longer and without the use of aids like a cane. I’ve helped strengthen weakened muscles in young athletes who are overpronators and seen them take their performance to the next level – qualifying for the Boston marathon, passing military physical assessments with flying colors, and entering athletic competitions free of injuries for the first time in seasons. This stuff is powerful. It can mean the difference between daily comfort and function or pain and diminished performance. 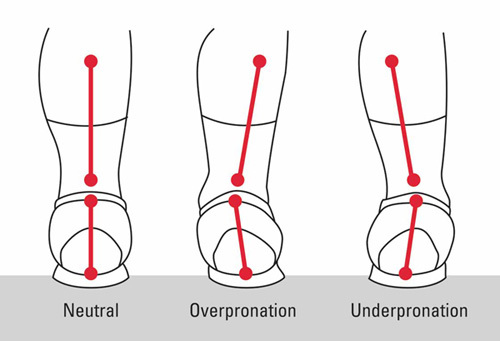 Read on for how to correct overpronation and strengthen/stretch affected muscles in the body. It’s very common for people who overpronate to walk with their feet “pigeon-toed” out, almost like a dancer in plie (though not quite so dramatic). Some people are only flat-footed/overpronators on one foot and thus, one foot finds a way to turn out while walking, running and even standing still. The problem with this is the asymmetry it creates throughout the whole body, leading to the aforementioned cascade of injuries, aches and pains. The nice thing is that it’s quite easy to correct for this turning out of the foot through active awareness. In other words, watch your feet while you move throughout your day and/or workout and make sure that both toes are pointing straight so that the feet are both in a neutral stance. You’ll be shocked at how unnatural it feels to walk with both feet straight at first but with some increased awareness and effort over time, this can do wonders for injury prevention and balanced strength. Walking and exercising barefoot (when safe and sanitary) can actually help overpronators. That’s because it forces people to avoid a heavy heel strike, which is something many flat-footed folks do without realizing it. You see, there’s not much soft cushioning in our heels but we can’t feel how much discomfort this causes when we wear heavy running shoes. By ditching the sneakers we can suddenly acknowledge that striking the ground heavy with our heels doesn’t feel so great. We naturally adjust our foot strike so that ground force is absorbed through the arch (which was “built” for just this purpose) and the muscles of the foot and leg. Note: If a physical therapist determines that you have a bony alignment problem in your foot then going barefoot won’t help anything. So if barefoot work feels like it’s worsening the problem then go see a professional to get an accurate diagnosis. This tip is pretty straightforward. To help correct overpronation you can lace your shoes all the way to the top eyelet and make sure the fit is snug. Many shoes come out of the box without being laced all the way to the top because it’s easier to try them on this way but don’t be afraid to lace farther up. You may decide you need to swap the shoe laces for a longer pair or you can try a few workouts with the current laces and tug on them to help them stretch out (which most do). Foam rolling or using a firm tennis or lacrosse ball can be very useful in helping tight muscles release. The flat-footed crowd is notorious for tight calf muscles and for shin splints, so applying gentle pressure (pressing upwards – not downwards – to avoid varicose veins) will help release fascial tissue and prevent/help heal shin splints. I also recommend rolling out the arches because as someone works to correct overpronation they are strengthening through the arch and causing new tightness that we want to be sure doesn’t become plantar fasciitis (again, this is all assuming the pronation isn’t caused by a mechanical/bony alignment issue that can’t be corrected via exercise). Foam rolling the IT band in a combination of long and short/pinpointed strokes (like near the top of the hip) can help release this long band of fascial tissue. When the IT band is tight (which it often is due to the excessive rotation that’s happening with overpronation) then the knee is placed under undue stress and the glutes can’t function optimally. It’s common for foam rolling to be very uncomfortable due to extreme tightness of the IT band so it may help to start by having someone else move the roller up and down the sides of your legs while applying the amount of pressure you can handle. Something that’s highly interesting to the exercise science nerds in the world (ahem, like myself) is that overpronators overuse their big and second toes for balance instead of all the toes. While it’s true that the big toe’s primary role is to aid in balance, it’s detrimental to muscular balance to only or heavily rely on that for balance aid and “pushing off” the ground while walking and running. So, exercises focusing on using all the toes evenly for balance is a great start for strengthening neglected body parts. Many flat-footed individuals run with a tiny bit more flexion in their knees than their counterparts. Often there is also medial stress added to the knee thanks to the excessive rotation happening in the lower leg that drives rotation of the upper leg (femur). Thus, it’s important to strengthen the quads through isolated quad extensions and other functional movements such as squats and lunges. To help correct the medial knee stress, strengthen the most medial compartment of your quads (the vastus medialus oblique – VMO) by doing quad extensions with the feet turned out. This targets that medial muscle and allows it to activate. You can even try pulsing up and down gently to get this muscle to burn – which in this case, will be a very positive thing for your body. Tight hamstrings and hip flexors are routinely the result of glute (aka booty) muscles that aren’t working at full steam. Holding 60-120 second stretches will help release these tight muscles and any associated pressure they’ve created on the lower back and glutes. These long sustained stretches should be done at the end of a workout but you can do shorter stretches of 15 seconds or less to help them limber before a workout. Think clam shells, side lunges and side lying leg lift series from Pilates. These exercises will help strengthen the “outer thigh” muscles located at the top and side of your legs. This area is a part of your glute muscle group and it helps decelerate rotation of the leg when walking and running. As mentioned, with overpronation there is excessive rotation and thus, these muscles are often stretched out and weak. When they’re strong we can better control overpronation and also decrease IT band tightness. Woo! The powerhouse muscle in the body (aka booty muscle) needs to be strong and in control at all times. The musculoskeletal system’s chain of command gets thrown off for the flat-footed crew so it’s important to place strength back where it belongs. Exercises can include hip bridges (see above pic with the modification of adding a leg lift – which makes it harder), squats, lunges, plie squats, side lunges, leg press, hip extensions, dead lifts, single leg dead lifts, incline work on cardio machines, and more. Don’t forget to do these with the toes pointing straight – not turned out! Last but not least, maintaining flexibility and strength in the lower back is important for preventing lower back pain that may result from excessive strain and ground-force impact associated with flat-footedness. Try back extension exercises on the mat such as supermans, roman chair back exercises, yoga extensions and chest openers, and more. Cheers to moving better and feeling great! This entry was posted in Fitness and tagged Balance, barefoot exercise, barefoot running, biomechanics, exercise physiology, Fitness, flat-footed, foam rolling, gait analysis, gait control, glute exercises, ground force reaction, heel strike, injury prevention, overpronate, overpronation, personal training, runners, Running, VMO weakness, walking on August 29, 2018 by wellnesswinz.